True, The Witcher 3: Wild Hunt doesn’t exactly invade your personal space and violently hurl you into the mayhem and organized mess of an open-world RPG like its predecessor, but it does start off with a bang and like any good story, begins to weave the thread at an admirable pace. 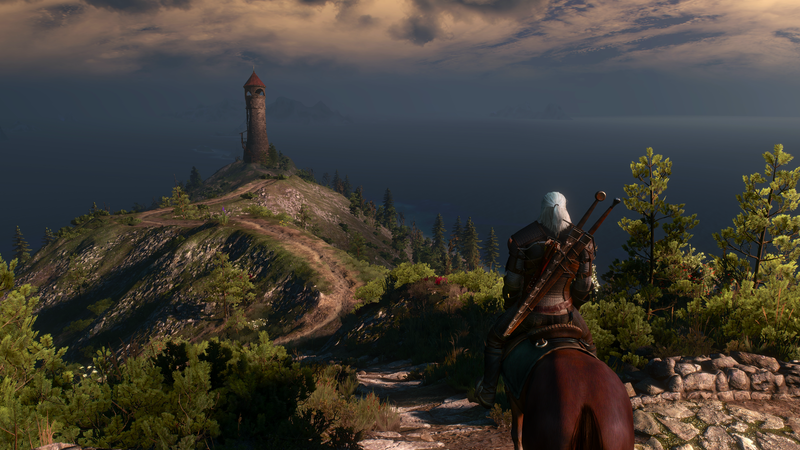 It’s already abundantly clear that the game has been made accessible to a wider audience than the fan base alone and while that usually spells out ‘watered down’ in most situations, CD Projekt Red have managed to craft the third installment in the series into an approachable and welcoming experience while staying true to what made it so great in the first place. To further improve the situation, while the game has been designed to essentially appeal to more than just fans of the series or the genre, it doesn’t hold your hand and takes no prisoners. We once again step into the well-worn boots of Geralt of Rivia, a handsome and muscular witcher-slash-monster-slayer after receiving a concerning note from a lost lover and known sorceress, Yennefer of Vengerberg. As Geralt shadows Yennefer’s trail, he soon discovers the potential danger she faces along with some surprising news: his surrogate daughter and fellow witcher, Cirilla, has returned from afar and is in harm’s way at the hands of the Wild Hunt—a circle of demonic specters that foreshadow misfortune and death. The story primarily revolves around Geralt following Ciri’s tracks, obtaining information from people she’s encountered and doing his best to locate her before the Wild Hunt does. In typical, open-world RPG fashion, this means that more often than not, you’ll find yourself as the errand boy for many characters in the game in exchange for information. Somehow though, it manages to not get annoying and the infamous “go here and fetch this” quests are not entirely commonplace. Like any good open-world RPG, The Witcher 3: Wild Hunt is a non-linear experience that offers decision making, dialogue choice and different paths to take during quests. In the manner of accessibility, it should be noted that you’ll be able to play and enjoy Wild Hunt without having to play the preceding games in the series—though having played the previous games or reading any of the books would prove useful as a foundation of understanding of characters, lore and history. If you’ve played The Witcher 2: Assassin of Kings on PC, you’re able to import a save and have your decisions reflected in Wild Hunt. If you haven’t, or are playing on console, you have the option to simulate a Witcher 2 save and make the key decisions of Assassin of Kings early on in Wild Hunt. It’s almost like Mass Effect Genesis, except without the awesome animated comic and detailed background information. Depending on your decisions in Assassin of Kings (or via dialogue choice at the appropriate time) there will be a handful of returning characters that offer additional quests and insight into interesting side-stories. In addition to the primary and secondary quests, Geralt can take on witcher contracts that involve hunting and slaying monsters and beasts to help the community and earn extra coin. Monsters in these contracts can range from the spirits of vengeful women and basilisks to grave-robbing, hunchbacked hags and creatures that conceal themselves in thick fog, awaiting their opportunity to attack. Witcher contracts not only prove to be a nice diversion from your primary goal as well as being the real source of income in a comprehensibly parsimonious economy, but a motivational push to venture outside of the peasant villages, big cities and main roads and explore off of the beaten path. As you explore, you might come across unique moments, disturbing landmarks like a tree of hanged men or war-ravaged lands in the wake of the Temerian-Nilfgaardian conflict. Similar to the civil war situation in The Elder Scrolls V: Skyrim, there is a sub-plot in Wild Hunt involving a war between the Northern Realms and Nilfgaardian Empire. Yes, like with most events in Wild Hunt, you will have an effect on the war as well. That’s one thing I especially like about the game; your choices do have consequences and there is no Paragon or Renegade, Good Karma or Bad Karma, there is simply your actions or lack thereof and the result. It changes the world around you and it does so in a way significantly more than past games have claimed. Character progression, crafting and alchemy made a return and have been simplified in some ways, while made a little more complex in others. With easier difficulty settings, you’re able to craft potions, oils and decoctions and restock them by simply meditating, which also regenerates health. With the harder difficulty settings, however, meditation will not regenerate your health; in addition, you’ll also find more use for the seemingly overwhelming variety of craftable consumables, especially bombs. Being able to replenish supplies via meditation was a feature I found to be most welcomed, considering that there doesn’t seem to be a way of figuring out where specific herbs grow; I found it significantly easier to locate the local herbalist and purchase a bushel of celandine for the Sparrow potion than it was to track it down and remember where I found it. There’s a handful of new recipes added that are all relatively useful in their own way, but I found that they aren’t really needed on the easier difficulty settings. Witcher potions also have a toxicity feature, which is essentially a limit for potion consumption. Drinking potions and decoctions will increase the toxicity meter and when it becomes full, Geralt will begin to lose health over time until the toxicity level is neutralized. So, essentially, Geralt can get potion-poisoning from drinking too many at once, so you won’t be able to down four or five vitality potions to completely regenerate your health. In addition to crafting consumables, you’re also able to craft armor and weapons as well as the materials needed for them. Unfortunately, as Geralt doesn’t have a travel sized anvil and forge, you’ll need to take the materials to a blacksmith or armorer to have them made and upgraded. Speaking of weapons, combat itself has received some improvements and is now so responsive, fluid and enjoyable, it’s easily comparable to the Arkham series, but with slightly more variety. 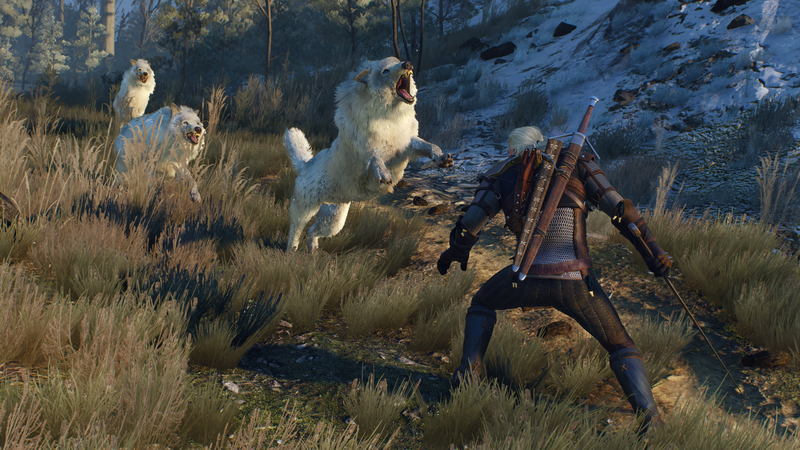 Geralt will use his silver sword on monsters and spirits and his steel sword on humans and generic animals and do so in a flurry of aggression, adrenaline and grace. The combat system can’t truly be appreciated unless one is playing on the harder difficulties, in which proper tactics and strategies must be utilized; on easier difficulties, one could usually get away with constant light attacks and a witcher sign or two. With the more difficult options, combat almost becomes an art in itself that demands respect and dedication to master. Witcher signs have made a triumphant return and serve as useful combat mechanics that give you an advantage over enemies. Yrden is a magic trap that can force wraiths and spirits to take a solid form to attack and damage. Quen serves as a protective barrier for Geralt that coats him in an orange shield to absorb specific amounts of damage. Igni is a fire spell that can be cast to set enemies aflame and ignite explosive elements. Axii can calm animals and stun enemies, which is particularly useful against human enemies using shields. It can also be used as a special dialogue option to influence hostile enemies to back off or tight-lipped enemies to offer information. Lastly, Aard is a telekinetic sign that can send enemies flying, destroy barriers and even disarm. It is possible to use ability points to upgrade the signs and make them even more effective in combat, doing enough damage to allow Geralt to use them as primary weapons. It adds a nice little flair and extra variety to combat. The Witcher 3: Wild Hunt offers an interesting and unique diversion called gwent, which is essentially a deck-building card game that is a quest in itself and certainly the most taxing. The concept is simple and basically requires you to defeat your opponent by your strength rating. It requires a solid understanding of the game, strategy and developing good tactics and that comes with not only practice, but building your deck. The difficulty comes in tracking down the cards needed to build a strong collection, especially considering that some of the best and most useful cards are easily missable. However, this is why most people make numerous saves with open-world RPGs; there is a quest aptly titled ‘Collect ‘Em All’ as well as a corresponding achievement/trophy for collecting every card in the game (excluding doubles and any cards added in the future expansions.) If you just happen to miss an opportunity to collect a unique card, you might as well start the game over, unless you don’t really care or are holding out for your second playthrough. Wild Hunt boasts some of the best visuals I have ever seen in a video game to date, especially for an open-world experience. It’s on another level and truly inspires more effort from other developers as well as raises the bar on what should be expected from games that offer less content. It doesn’t exactly share the same cinematic realism as The Last of Us or Until Dawn, but bearing in mind that it is a massive, open-world title, the graphics are truly a sight to behold not only for its genre but in a general sense. Everything looks the way it should and then some, as well as properly conveying environmental factors. Thunderstorms truly saturate the land and turn already dilapidated and humid swamplands even more uncomfortable. Barren, war-ravaged wastelands almost smell and feel grungy and decrepit. The amount of detail on the characters and the environment are staggering and seriously immersive. At the end of the day, what CD Projekt Red have managed to accomplish here is a memorable and appreciated experience that has truly delivered a “wow” factor to the gaming community. The Witcher 3: Wild Hunt is overflowing with the love, passion and care that went into creating it and it really shows. Coming from a developer that refuses to conform to the community standard of the bare minimum, you’re truly getting your money’s worth with this game and then some. Brand new copies of Wild Hunt come packaged with a thank you note from the development team, a lovely, detailed map of the game world, a Witcher Universe Compendium, a disc copy of the soundtrack and some stickers. CD Projekt Red have also announced that sixteen, free DLC items will be rolling out in the weeks subsequent the game’s launch, with four already available, ranging from armor, hair and beards to customize Geralt with, bonus missions and alternative character appearances. Lastly, there is also an expansion pass available that includes two additions to the experience. Hearts of Stone, coming in October, will take Geralt on a new, 10-hour adventure into the wilds of No Man’s Land and the streets of Oxenfurt to complete a contract dripping with deceit from the mysterious Man of Glass. Blood and Wine is a 20-hour adventure, coming in Q1 2016, that introduces a new game region, Toussaint, that’s untouched by the war and presents a carefree atmosphere, hiding an ancient secret. Both expansions offer new content, equipment, enemies and allies, for a brilliantly reasonable price. The Witcher 3: Wild Hunt is a prime example of pride and effort, setting a standard in the gaming community and raising the bar even higher. It exceeded my expectations and really made me take a step back and truly appreciate it. Not only do I find it a heavy contender for Game of the Year, but a strong example of master craftsmanship in the video game industry. Stay tuned for all updates surrounding The Witcher 3: Wild Hunt, including news and further reviews subsequent each expansion’s launch.